China's hunger for robots is huge and growing fast. More than one in four industrial robot units sold worldwide last year were in China, according to a new report. With its vast manufacturing base, the country dwarfs other economies' demand for the technology. The Chinese market for industrial robots jumped 17% last year to around 68,000 units, according to the International Federation of Robotics. That makes it bigger than the entire European market. Its companies are also hunting for foreign robot expertise. Chinese home-appliance maker Midea has launched a multibillion-dollar takeover offer for leading German robot maker Kuka, a move that's made political waves in Germany. Related: Should robots have to pay taxes? China's human workforce is shrinking as the population ages, and interest in low level jobs is waning. That's pushing up labor costs, undermining the competitiveness of exports. Robots offer a potential solution to plug the gaps. Foreign-based manufacturers supply more than two-thirds of the industrial robots sold in China. But Chinese companies' market share is increasing, up from 25% in 2013 to 31% last year, according to the IFR. Demand for factory robots is also growing fast in other Asian nations like South Korea and Japan. The U.S. is the fourth biggest market worldwide. 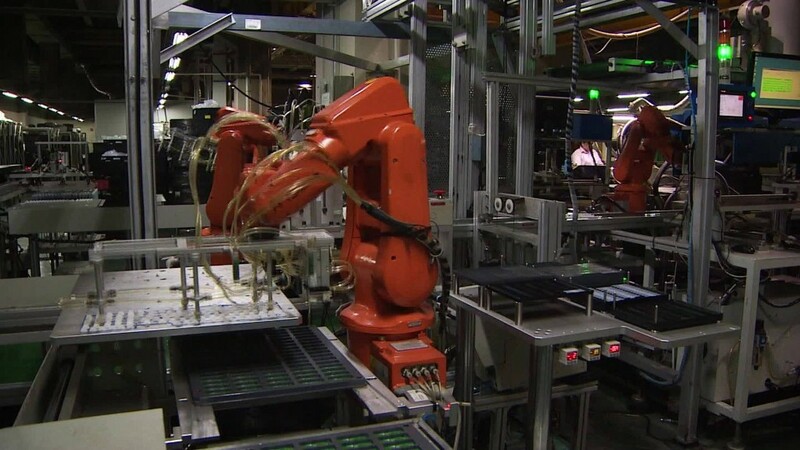 Global sales of industrial robots climbed 12% last year to 248,000 units, according to the federation. It expects that around 2.3 million robots will be deployed on factory floors worldwide by 2018, more than double the amount in 2009. They're currently most widely used in the auto industry. But popularity is rising in the metal, plastics and electronics sectors.